Performers include: Bob Denver, Alan Hale Jr., Jim Backus, Natalie Shafer, Russell Johnson, and Dawn Wells. In this animated Gilligan’s Island spin-off, the Professor (Russell Johnson) is able to build a crude rocket ship so that the castaways can finally escape their tropical island home. Unfortunately, thanks to Gilligan (Bob Denver), they overshoot their target and end up marooned in outer space on a distant planet. As per usual, castaways Skipper (Alan Hale, Jr.), millionaires Mr. and Mrs. Howell (Jim Backus and Natalie Schafer), movie star Ginger (Dawn Wells), and Mary Ann (Dawn Wells), make the best of their situation. 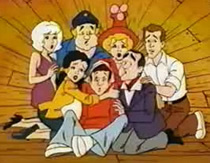 The original sitcom cast returned to voice their characters with the exception of Tina Louise who had played Ginger. Where Do Classic TV Characters Eat? McDonald’s? This was the last series Filmation Associates produced for Saturday Morning network TV, BTW.